AvtoVAZ expects Lada sales to rise 11% in 2010. 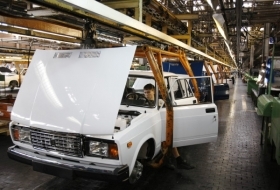 Shown is Lada production in Togliatti. MOSCOW (Reuters) -- Heavily-indebted Russian automaker AvtoVAZ appointed Sergei Kogonin, head of truckmaker Kamaz, to its board of directors, increasing the prospect for the creation of a state-controlled autos giant. Kogogin agreed earlier this year to head a proposed holding company for government stakes in Kamaz and AvtoVAZ controlled by Russian Technologies -- a huge state conglomerate with interests in aviation and defense as well as autos. The move is seen as part of a long-term Russian effort to revive its embattled car industry, struggling under falling demand, high debt, outdated technology and a bloated work force. "This appointment will be connected to Russian Technologies' plans to create an autos holding company for its stakes in these companies," VTB analyst Vladimir Bespalov told Reuters. "A new company may make it easier to secure new loans for AvtoVAZ, which is finding it extremely difficult to attract money. Other stakes could be used as collateral," he added. AvtoVAZ, which also on Friday said car sales would rise 11 percent in 2010, needs to restructure a $2 billion debt pile and reverse heavy losses to survive. Russia's state development lender VEB later told Russian agency Interfax it was prepared to finance an investment program in AvtoVAZ after its debt restructuring is completed. "After the debt restructuring format is defined, after the strategy is drafted, we are ready, together with other banks, to take part in funding the investment program," VEB Deputy CEO Alexander Ballo was quoted as saying. Russian Technologies has a 37.8 percent holding in Kamaz, but sources told Reuters earlier this year it is talking to Moscow investment bank Troika Dialog about acquiring its 13 percent stake in the truckmaker. It also has a 25 percent stake in AvtoVAZ. The role to be played by overseas carmaker investors Daimler AG and Renault SA in the Russian car industry remains uncertain, as neither has shown any willingness to add to stakes purchased amid more favorable economic conditions. Germany's Daimler, a 10 percent stakeholder in Kamaz, has first refusal on the Troika stake, but the head of its trucks division told Reuters last month it was happy with the level of the stake for the foreseeable future. Renault, which paid about $1 billion for 25 percent of AvtoVAZ nearly two years ago, has remained tight-lipped on its plans for the company despite public invitations from Russia to open talks to buy a bigger stake. First Deputy Prime Minister Igor Shuvalov said this month Renault must be a part of the process, and is due to give an update on the work of a commission to resolve AvtoVAZ's problems on Tuesday. Prime Minister Vladimir Putin is due to visit Renault's headquarters outside of Paris this week. During the visit, AvtoVAZ and Renault will on Nov. 27 sign a memorandum of intention for future cooperation and may discuss the French company's future input into the Russian one, Maxim Nagaitsev, AvtoVAZ vice president in charge of sales, said on Friday. Russian plans to shake up the industry were dealt a blow earlier this month when General Motors Co. decided not to sell Opel, its European arm, to a consortium including Russian lender Sberbank.